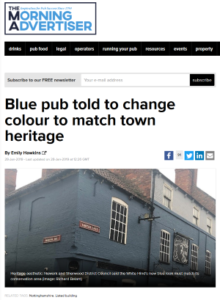 The Morning Advertiser has reported on how Newark and Sherwood District Council has said the White Hind’s new blue look must match its conservation area heritage aesthetic. One licensee has been left feeling blue after being told his pub’s new shade goes against regulations over the building’s listed status and place in a conservation area. Licensee Richard Belam said it was unfair for the paint job at the White Hind in Newark-on-Trent, Nottinghamshire, to be called ‘incongruous’ by the council. Newark and Sherwood District Council said it was ‘committed to preserving and maintaining the town’s heritage,’ and considerate of the local character present in its rows of cream-coloured Georgian sites. Consent is a legal requirement for alterations that affect a listed site’s character as a building of special architectural or historic interest. After almost a decade standing derelict, the pub reopened in 2010 under the name Belam’s Bar and Bistro following ‘blood, sweat, tears and a lot of help from good friends,’ said Belam. However, the pub saw a drop in trade last year owing to anti-social behaviour on the high street and congested roads, with local businesses struggling to meet their overheads, Belam explained. A decision to rebrand in December 2018 signalled the ‘last straw’ to revive the pub’s fortune. Changes included reverting to the pub’s historic name, the introduction of a carvery – and a fresh lick of paint. But the council dubbed the steel blue as ‘out of character and imposing’ among its more subdued neighbouring buildings. A pale grey shade on the upper-half of the pub has also been opposed owing to the colour contrast. ‘We feel this is unfair as the colour hides some of the building’s defects and will not take as much maintenance to keep clean. We are making every effort to maintain our business properly and help boost the local economy,’ Belam told The Morning Advertiser. Other listed businesses in the area were ‘deteriorating daily’ and not being made to keep up with heritage guidelines and rules, he maintained. Matt Lamb, business manager of planning development at the council, said the colours were ‘not in keeping’ with those normally permitted within the Conservation Area, and that it would be working to agree a new colour scheme for the pub. While buildings in the area are generally built from red brick, the White Hind is an example of several rendered and painted buildings ‘predominantly, albeit not exclusively, in pale shades such as creams and whites,’ Lamb explained. ‘The use of the blue shade in this context (on a building of this age and form) and over such a large area is out of character and imposing. The style of this listed building is one seen reflected throughout the town in attractive rows of Georgian town houses and this consistency gives the town a strong local character which is a positive feature of Newark, which the new colour of the pub is not in keeping with. We are more than happy to discuss alternative colour schemes and timescales and costs involved in this.’ The pub must now apply for retrospective planning permission or decide on a new colour.